Donald Prothero taught college geology and paleontology for 35 years, at Caltech, Columbia, and Occidental, Knox, Vassar, Glendale, Mt. San Antonio, and Pierce Colleges. He earned his B.A. in geology and biology (highest honors, Phi Beta Kappa, College Award) from University of California Riverside in 1976, and his M.A. (1978), M.Phil. (1979), and Ph.D. (1982) in geological sciences from Columbia University. 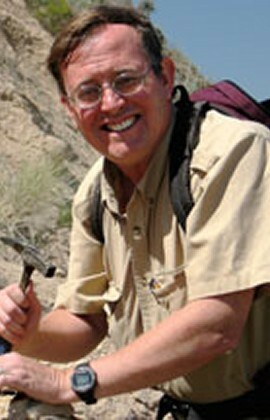 He is the author of over 40 books (including 6 leading geology textbooks, and several trade books), and over 300 scientific papers, mostly on the evolution of fossil mammals (especially rhinos, camels, and horses) and on using the earth's magnetic field changes to date fossil-bearing strata. He has been on the editorial boards of journals such as Geology, Paleobiology, Journal of Paleontology, and Skeptic magazine. He is a Fellow of the Linnean Society of London, the Paleontological Society, and the Geological Society of America, and also received fellowships from the Guggenheim Foundation and National Science Foundation. He served as President of Pacific Section SEPM (Society for Sedimentary Geology) in 2012, and served for five years as Program Chair of the Society of Vertebrate Paleontology. In 1991, he received the Charles Schuchert Award for outstanding paleontologist under the age of 40. In 2013, he received the James Shea Award of the National Association of Geology Teachers for outstanding writing and editing the geosciences. In 2015 he received the Joseph T. Gregory Award for service to vertebrate paleontology. In 2016, he received the "Friend of Darwin" award from the National Center for Science Education. He has been featured on numerous TV documentaries, including Paleoworld, Walking with Prehistoric Beasts, Prehistoric Monsters Revealed, Monsterquest, Prehistoric Predators: Entelodon and Hyaenodon, Conspiracy Road Trip: Creationism, as well as Jeopardy! and Win Ben Stein's Money.